Now that time has continued its march to the start of a new year, it is once again time for resolutions. In the cycle of teaching, this stage is actually one of the things I look forward to the most because it gives me another chance to look at the missteps of the previous semester and chart a course to actually do it right this time. One of my major resolutions this semester is that I want my students to write more. Nearly any writing teacher or study of note points to lots and lots and lots of writing as an essential ingredient to student writing growth. Colleen Cruz in The Unstoppable Writing Teacher suggests writing 30-45 minutes at least four times per week. The massive 2011 study “The Nation’s Report Card” found that the students who performed the best on writing reported doing it for 30-60 minutes in class each day. Kelly Gallagher simply reminds us that in the same way that the best swimmers swim the most and the best readers read the most, the best writers generally write the most. I think most teachers wouldn’t disagree with the idea that having students write more will probably help them write better, but where that gets tricky for me (and I would guess for many others) is that I already have so much stuffed into each day that finding time to assign and respond to more writing hardly seems reasonable for my students or me. The good news is that if a writing activity or assignment is carefully designed, it doesn’t necessarily have to add extra grading time and supplant content. In fact, if it is really well designed it can even aid in helping you to teach more curriculum in less time and cut down on the hours that you spend responding to student work. The answer to how you add more writing without adding more response time to student writing is actually pretty simple: you don’t have to respond to everything students write. While not responding to a piece of writing can feel like skirting your duties, there are actually types of writing where limited responses or no response at all are completely acceptable. To explain more about those I am going to turn it over to Dave Stuart Jr. and his Pyramid of Writing Priorities that he developed from The Core Six by Silver, Dewing, and Perinea. 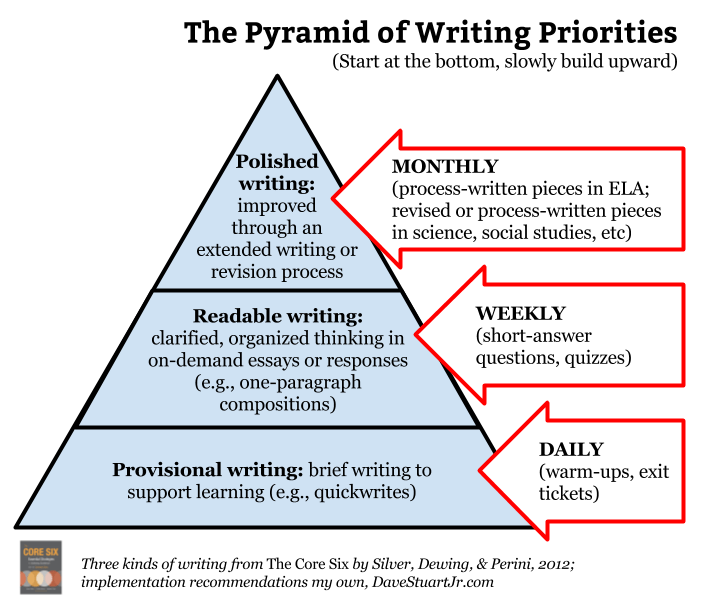 Stuart’s pyramid nicely illustrates three categories of writing–provisional, readable, and polished–two of which don’t need full teacher responses. The idea is that each of these types of writing has a different purpose and thus gets a different response (or lack of one). Provisional writing is where students write only for themselves to process what they just learned or play with a new concept. Generally, this type of writing actually works better if teachers don’t respond because it gives them the freedom to practice without the pressure of having a teacher view it. Readable writing is where the writer imagines an audience or actually shares the work with an audience (sometimes fellow students and occasionally the teacher), but the writing is generally focused on only one or two elements (for example, a quote ID on a test for Romeo and Juliet would probably be assessed purely on the understanding it shows; you wouldn’t grade the student on diction in this situation). Like provisional writing, a response isn’t always needed either, and when it is needed it can often be provided by peers. If the teacher does respond to readable writing, the feedback can usually be given a lot faster because since the writing is limited in its scope, the feedback can be too. Polished writing is where a writer goes through a robust writing process and reaches a “final” draft that is supposed to show the writer’s overall writing ability. Because of the more individualized and complex nature of this task, this type of writing does generally require robust feedback, though I will talk in future posts about ways that feedback can be made more efficient and effective. In my quest to add more writing this year, it frankly isn’t feasible to add more polished writing because of the time it requires for both the students and me, but I can add a lot more readable and provisional writing that, if designed thoughtfully, won’t add even an extra minute of looking at student papers. The answer to how to add more writing when you already have too much to learn is actually pretty simple to: research has shown that writing is one of the most effective ways to learn content. If you want students to learn about the Constitution, Bohr’s Model, or Allegory, there is likely no tool more effective than having them write about it. This means that by having students write regularly about content you can actually have them learn the same amount of things in less time AND simultaneously practice their writing skills! If the idea of getting more learning in less time by having them write more do an seems a little too abstract and too good to be true, here are a couple examples of this from my classes last year. The first is a lesson about symbols from my 9th grade English class. In previous years, I’d taught about symbols through a mini-lecture on symbols followed by having them draw a symbol from a short story we read. Last year, in an effort to add more writing and use writing to teach content, I instead gave students the following list of common symbols (see below) and had them write a story stuffed with as many symbols as they could possibly squeeze in to “give it depth.” The result of this was that I was able to add an extra writing assignment and noticeably more students clearly understood how symbols work and why authors use them in the final assessment. In fact, the lesson worked so well that a number of my students even began to use symbols in their writing, which is something that I’d seen only a handful of times before that year. Another example comes from my composition class where I jettisoned the grammar worksheets in favor of a one page free-write homework assignment where students had to use dashes, semicolons, colons, and commas correctly in quick, silly stories. This switch resulted in far deeper understanding of the concepts because they weren’t just learning them in a detached lesson; they had to integrate the new knowledge with their own writing. Further, responding to the free-writes took me no more time than responding to the worksheets because even though they wrote full stories, by focusing my attention purely on punctuation, I was able to go through the entire stack of papers from a class of 34 in less than 15 minutes. This year, empowered by the fact that more writing doesn’t necessarily mean more grading time and less curriculum, my stretch goal is to finally live up to recommendations of those writing instruction icons by having students put pen to paper in a meaningful way every single day. Tagged How much should students write? That was a dense post! Like a good steak, I’m stuffed, no room for dessert! What I’m wondering is what were the results? How did it go? Great! I’d long understood that having my students write more was key to them developing as writers, but it wasn’t until Stuart’s “provisional” and “readable” categorizations that I finally was able to let go of responding to all of the writing the students produced. This last year my students did exponentially more writing and they got the highest grades and writing test scores I’ve seen yet, and I think taking a quantity and quality approach was a huge reason why. Thanks for following too! It is fascinating to me that we teachers get locked into a certain way of thinking, and can’t let go. Although I didn’t have the categories of writing that i initially read in DSJ’s prototype to These 6 Things, I do remember those categories unlocking my understanding of how I approach assessing all the writing students were doing in my class. It freed me up to go for it! But really, the only thing that was standing in my way was a flawed perception of writing instruction. And it was just in my head! !